“Overview” is your main working area and is designed to give you a general overview of your trades and their stats, as well as multiple possibilities of various modifications and customizations. Overview Toolbar directly below Header contains links to total summary stats and buttons for basic actions, needed in the “Overview” menu. 1. 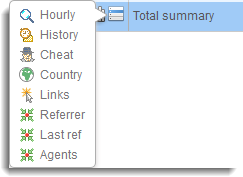 Quick stats buttons total summary stats for Hourly, History, Cheat, Country, Links, Referrers, Last ref, Agents, Keywods. 2. Expand / Collapse button expand / collapse quick total summary links. 3. Interface manager opens an Interface manager drop down menu. 4. Niches opens a Niches drop down menu. 5. Add trade opens an Add trade drop down menu. 6. Trash opens Trash window. 7. Help will load related information in our User manual. Toolbar quick stats buttons (Hourly, History, Cheat, Country, Links, Referrers, Last ref, Agents, Keywods) contain links to total summary stats, which can also be accesed from the Multi task icon in the “Total summary” row (total summary for all your trades). Mass edit panel allows you to perform the same action (edit, reset, delete…) on multiple trades at the same time. Check box trades in the stats table and Mass edit panel will automatically slide-up from the bottom.